Home › Digital Post › Cowabunga, amigo! 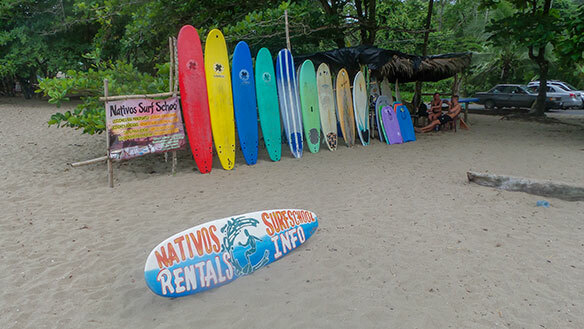 The Costa Rican community of Puerto Viejo is building a tourist following, many of them young surfing dudes and dudettes drawn by the waves off its Caribbean Sea-fronting shores. Puerto Viejo was populated in part by people whose forefathers were from Caribbean islands, with English last names common in the community. And, says tour guide Greivin Cubero Ramirez, the Caribbean influence is partly evident by the numerous bars in the community offering reggae music. “This is like a little Jamaica,” he says. Ethiopian flags – often flown by Rastafarians, whose religion tends to be associated with Jamaica – can be seen at some points in town. Images of reggae legend Bob Marley can also be seen around the town. Puerto Viejo has clearly gone the tourism route, with its streets lined with bars, restaurants, B&Bs and boutiques. Visitors will also find numerous shops renting bicycles, a popular mode of transportation in town, and surfboards. Surfing lessons are easily available. Lodging options in the Puerto Viejo area include the three-star Cariblue Beach & Jungle Resort, which has guest units found in a tropical garden setting that’s home to different creatures, among them birds, butterflies and monkeys. Guests can stay in bungalows that have such amenities as a safety box, WiFi, A/C, ceiling fan, cable TV, hammock, balcony, hair dryer, and a refrigerator. The resort has the likes of a swimming pool, a bar, a pool bar, restaurant, Jacuzzi deck, shop, and a fitness area. Among tours available for hotel guests are a canopy tour, horseback riding, whitewater rafting, bird-watching, hiking, and snorkelling. More information can be found at www.cariblue.com .